Supply and Demand (in that order): Elderly Employment during the Recession: Supply or Demand? 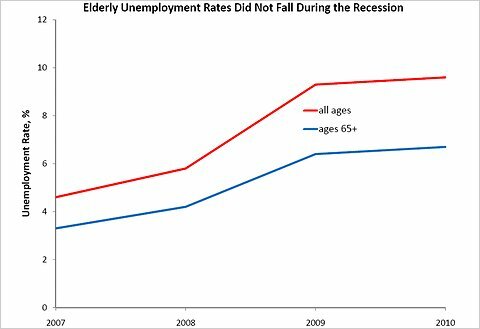 Elderly Employment during the Recession: Supply or Demand? The supply of elderly workers increased during the recession, and employment rates of the elderly increased along with it. This result is difficult to reconcile with Keynesian characterizations of the labor market. Last week I showed how employment per capita had increased slightly among elderly people since 2007, while employment per capita in the general population plummeted. I, and other economists previously, have concluded that employment of the elderly deviated so much from the general population because of changes in elderly labor supply. Recession-era supply episodes like these are important to identify, because they can prove or undercut Keynesians’ fundamental argument (so far unproved) that supply does not matter during a recession or during a “liquidity trap” such as we’ve experienced since the recession began. In reaction to my post last week, Dean Baker, co-director of the Center for Economic and Policy Research, offered some analysis of weekly earnings and concluded that the demand for elderly workers increased during the recession even while it plummeted for everybody else. Supply played little or no role, he said. Generally, I agree that wage rates are an important variable for gauging the relative importance of supply and demand (see, for example, my analysis of labor supply during the summer season, which featured hourly wage rates as one of three key indicators). But in this case, Dr. Baker’s weekly earnings results ran into a few contradictions. First, what was the demand shift experienced by elderly workers that was so large as to completely offset the demand shift purportedly experienced by the rest of the population? Perhaps elderly workers picked up some of the hundreds of thousands of jobs that teenagers and other unskilled workers lost thanks to the minimum wage increases? Dr. Baker did not say. Second, a huge increase in demand for the elderly might be expected to reduce their unemployment rates, yet the chart below shows how unemployment rates for the elderly followed very much the same time pattern as unemployment rates for the general population. (According to the Census Bureau, every person is either employed, unemployed or not looking for work, which is why unemployment and employment can move in the same direction). Dr. Baker’s purported demand shift is not visible in the unemployment data. Third, Dr. Baker’s own data suggested that something other than demand was driving most, if not all, of the earnings changes he measured. Elderly employment per capita increased only 4.5 percent. Demand increases by themselves usually increase wage rates about the same amount that they increase employment, which in this case would be well less than 10 percent (for example, during Christmas season, when demand increases employment rates more than it increases wages, not less). Labor supply, rather than labor demand, readily explains why elderly unemployment rates tracked the general population’s during the recession, while elderly employment did not: the willingness (or necessity, if you want) of working had changed more for the elderly than for the rest of the population. The fact that labor supply really does matter during recessions means that Keynesian policy prescriptions will not deliver what they promise. People make it amusing and also you however have the ability to maintain this sensible.Yacon When i won't be able to delay to learn additional by an individual. This kind of is often a fantastic blog. conditions is actually a new difficult task regarding maqui berry farmers. Annually a new most of the plant life have been destroyed caused by undesirable conditions. oh brother thanks for the funnies. I have been on all sides of this at some point. Learning the game being a baddie, watching idiots interact and these days trying to mediate a lil more cuz I am not a total noob. Funny funny stuff. Why Hasn't Employment of the Elderly Fallen?